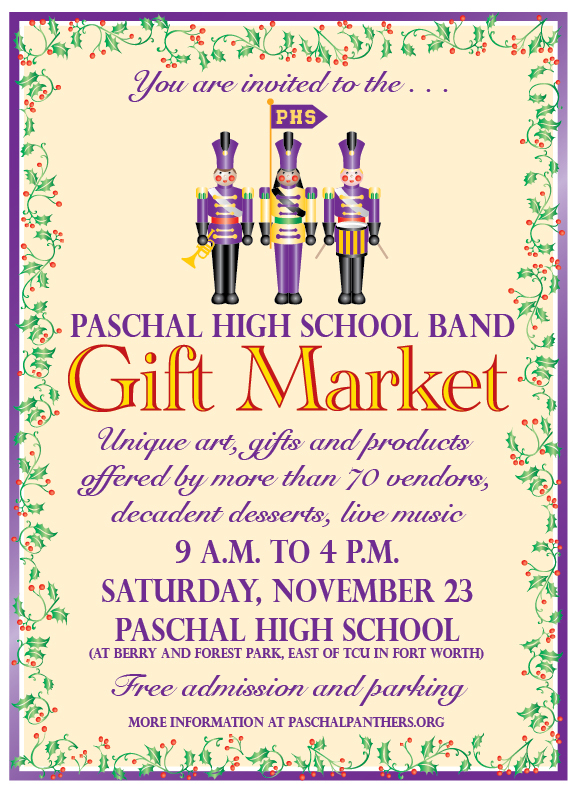 "Paschal High School Band's annual Gift Market is Saturday, November 23, 2013, from 9 a.m. to 4 p.m. Admission and parking are free. 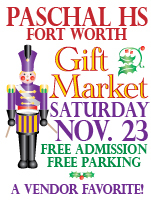 This all-day gift market features unique arts and crafts, handmade gifts and products offered by more than 60 vendors, plus fantastic homemade desserts. 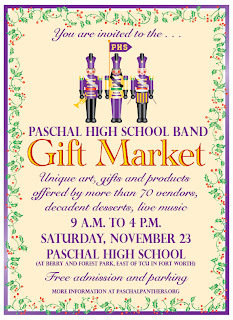 All proceeds benefit the award-winning bands at Paschal High School (3001 Forest Park Blvd., Fort Worth, 76110 ... at the corner of Berry and Forest Park, east of TCU in Fort Worth.). Come out to shop for the holidays, enjoy great desserts and live music from our band students." 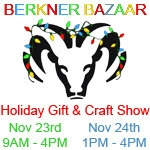 "The 5th Annual Berkner Bazaar will be held on Saturday and Sunday, November 23 and 24, 2013. The Berkner Bazaar is held at Berkner High School, 1600 E. Spring Valley Road, Richardson, TX 75081. Hours are from 9 to 4 on Saturday and 11 to 4 on Sunday. This event is held the weekend prior to Thanksgiving to help you get into the holiday mood and get a jump on your holiday shopping! 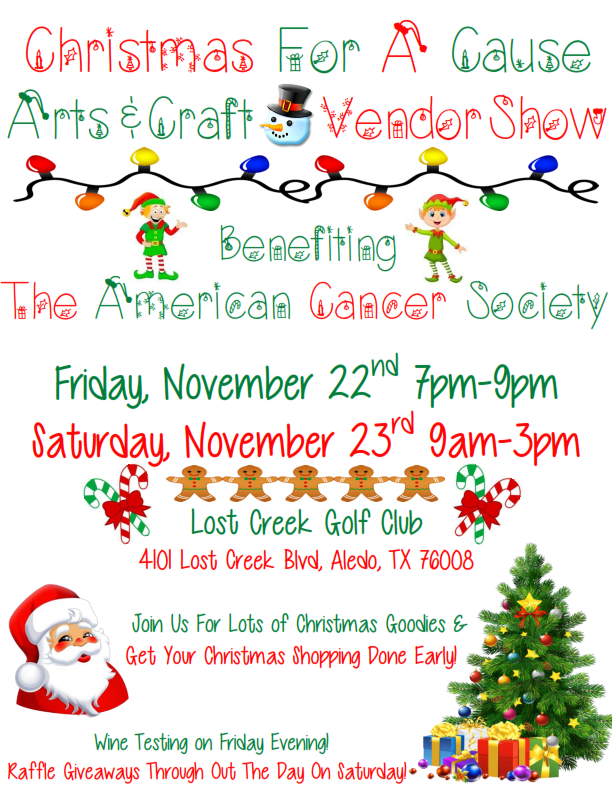 Over 75 vendors offer wonderful gifts and treats that you won't want to miss out on - many are a one of a kind item! Mark your calendar now! Supports the Berkner High School PTA." "We’ve moved our previous Mayfest Market to the fall! We’ve also extended it to a two day event. Please join us for our inaugural fall event. 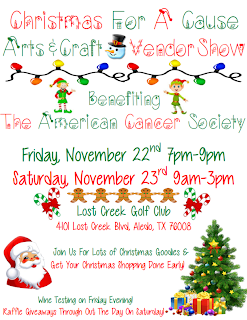 Vendors from around the metroplex will be here to share their crafts and other wears. We'll also be having hourly raffles, bake sale, and PICTURES WITH SANTA! The proceeds of this event will be used to fund many CWA projects including but not limited to the CWA Christian Service Scholarship for college bound JPIIHS seniors." Located at the corner of Plano Parkway and Coit Rd. "Artisan and Hand-made Goods, Favorite Brand Name Companies, Bake Sale, and Raffle Prizes"
"Come join us! A perfect place to start your holiday shopping! The Saint Mary the Virgin Fall Bazaar has been in existence for eight years. Held at the parish in Arlington, Texas, it is unique in that it combines both parishioners and the general public, traditional style crafts, indie handmade items and small businesses. Jewelry, fiber artist, quilts, soap, bath and body, herbal gifts,handmade holiday items, handmade toys and religious items, scrumptious bake sale tables, home business/direct sales vendors, and many more interesting goodies. Featured musical entertainment, lunch for purchase, raffles, door prizes and lots of fun! Held the Saturday before Black Friday this year, it is a perfect stop for Christmas shoppers, and a perfect venue for craft show vendors." "6th Annual Craft Fair at the Calvary Baptist Church at 401. W. Church St. Grand Prairie, TX 75052. November 23, 2013 9 am to 3 pm. All kinds of vendors from Mary Kay, Scentsy, all kinds of crafts, face painting, wreaths, jewelry, and more. Concessions stands available. "